lake of shining waters: IT'S ANOTHER SUNNY DAY! Yours was the first blog I opened this morning and you made me smile with such a cheery greeting. I was feeling kinda grumbly. I love the china. Once in a while I take out my grandmother's china and use it too. The old stuff is so pretty and delicate isn't it. 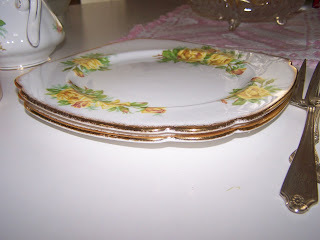 Pretty china ~ and great reason to use it. Too often we let these lovely treasures sit unused in a cupboard instead of enjoying them. I love the LHN design! Your dishes are so lovely with all the autumn touches. And that needlework piece is precious! It won't take you long to finish it. More sun? Fantastic! We've had two beautifully fallish days here too. I love it! Oh! i LOVE the cross stitch you are working on!!!!!! It's beautiful!